With all those sad news about the global economy, it's hard not to be affected psychologically. However, if you know how to laugh in the face of danger, everything's going to be OK. Lately, I've been reading a lot of online jokes that I bumped into this old and stagnant website which featured a funny comic strip entitled Hackles. 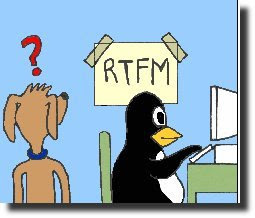 The main character named Hackles is a dog programmer who is clearly into Linux and open source. He is joined by two tux-looking penguins, a web-developer cat, and some other cool characters. If you are a pure-blooded geek, you will surely enjoy Hackles as it is filled with humor about hacking/programming, Unix/Linux, and just about anything that's related to computers. * What is the best search engine? I hope Hackles and the gang will be back someday as they sure know how to make a geek laugh. Hackles is my favourite comic strip for ever and ever. I've been crying since Hackles freezed. Thanks a lot for this one. I didn't know there exists a comic strip like Hackles. It sure is still funny even though it's kind of old. The couple who did hackles together broke up... and didn't want to keep doing the strip together.